When I first started working in IT a few decades ago, a proxy server was known as an application gateway. That definition still is fairly accurate in some contexts, but in the world of the internet it sounds a little dated. 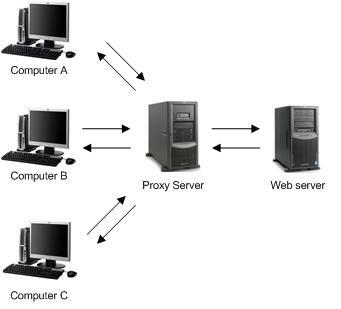 In technical terms a proxy server is an application that sits between and mediates traffic between two or more network segments. The proxy is a middle man, it sits between source and destination systems, in fact it ensures both never actually directly communicate with each other. In this description your computer/laptop/smartphone is the source system requesting information from the web servers which are the destination systems. The concept is easier to understand from the above illustration which shows how a proxy sits in between various computers and their destinations, receiving and forwarding data as required. It’s important to know that a proxy doesn’t actually intelligently route information – it simply forwards it, there are no decisions on routing made at all other than a basic send and receive. One of the best analogies of a proxy is to think of a discussion between two people speaking through an interpreter. All communication passes through the interpreter, their job is to pass data back towards the two people in a format they can both understand. The language analogy is particularly apt because in some senses the proxy is speaking to completely different systems. For example the computers might be running different versions of windows, Linux or OSx and the web servers will likely be based on Unix, Linux or Windows server systems – the proxy must communicate and forward data between all these different systems. So why are proxies so important and widely used now? If a proxy server is properly configured, which is not necessarily the case, then both the sending and receiving computers will have actually no knowledge of each other. In fact if set up completely securely then the web server will be completely unaware of the existence of the proxy. In any case, the web site will have no record of the client PC, it also isolates the computer from any potential security problems such as viruses or malware. All over the internet, there are many thousands of sites which restrict access based on your physical location. This is determined by where your IP address is registered. Unfortunately many of these sites are the biggest and most popular on the internet – sites like the BBC iPlayer, ITV player, Netflix, Hulu, HBO and NBC to name but a few. Add to these thousands of forums and social media sites like YouTube, your address can end up restricting you greatly depending on your location. Using a proxy can solve all this, because the site doesn’t see your address but merely the proxy’s IP address. People use proxies to watch the BBC online from outside the UK, or to watch Hulu beyond the US. Many services are now available to access these sites, in fact a whole industry has arisen. Most even have the facility for addresses from smaller countries – fancy watching the hurling on RTE, just pick one that provides an Ireland IP address. There are many countries in the world, where the internet is heavily censored – in some countries many thousands of sites are inaccessible. Places like China, Iran and Thailand block access to many sites determined by their leaders. Even places like Turkey have been known to block popular social sites like Twitter and Facebook from being accessed. There are a variety of ways that these filters are enforced but most involving blocking access to the web sites or their specific IP addresses. However when you use a proxy as we have learnt you don’t request direct access to the web server, it goes through the proxy server first. Which means as long as your proxy address isn’t blocked the site will still be accessible. It is why hundreds of thousands of people use proxies in places like China to access web sites that are normally blocked. Although if you are concerned about your privacy, using a VPN server which is provides an encrypted tunnel is probably safer.